It's been a busy couple of weeks, finishing quilts and class samples. 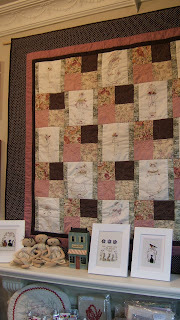 Life's Pleasures and Treasures is back from the quilter, so just have the binding to go. Maybe by Friday! 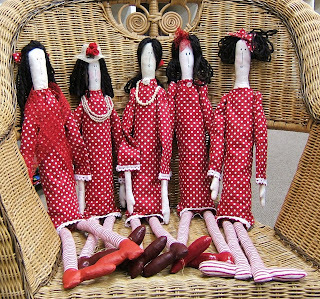 We had one of the final Red Clubs last night, and the girls brought in their dolls from last month. What a gorgeous line-up! 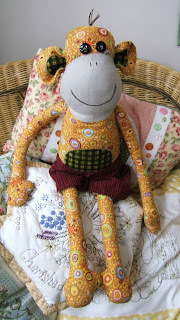 Wendy also brought in her ''Magoo'' to show us - he is awesome - one of the favourite Melly & Me patterns. You just want to give him a snuggle don't you! 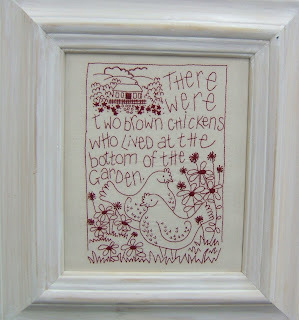 This is one of Debbie's latest stitchings, Two Brown Chickens, which is a newly released pattern from Leanne Beasley. Debbie found a gorgeous wooden frame, the perfect size, and painted it white. Looks fabulous doesn't it. and here's a close up of Daisy. Now I'm off to start the binding on the other quilt. The quilting looks fab and putting the binding on is one of my favourite parts of the quilt-making. 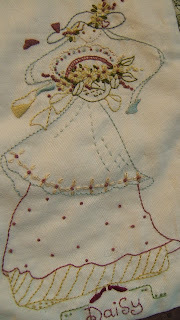 A Pleasure to Stitch Life's Treasures.